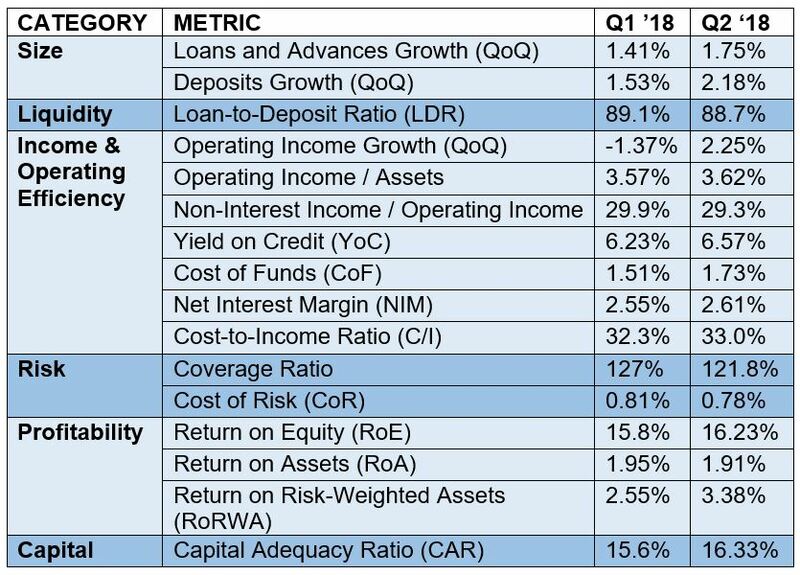 Significant growth in operating income; Deposits grew at a faster rate than loans; Liquidity remained stable, despite reduced loan to deposit (LDR) ratios. Dubai – Leading global professional services firm Alvarez & Marsal (A&M) today released its latest UAE Banking Pulse for Q2 2018. The report shows that UAE banks’ profitability continued to increase, with operating income and net interest margins significantly higher than in the previous quarter. Comparing the data of the 10 largest listed banks in the UAE, Alvarez & Marsal’s UAE Banking Pulse report looks at the second quarter of 2018 (Q2 2018) against the first quarter (Q1 2018), identifying the prevailing trends throughout the intervening period. Deposits grew faster (2.18 percent) than loans & advances (L&A) (1.75 percent), resulting in a slightly reduced average loan-to-deposit (LDR) ratio for Q2 2018. Despite this, eight of the top 10 banks remained in the LDR “green zone” of between 80 percent and 100 percent. Four of the top banks grew their L&A market share, and two banks increased market share overall (L&A and deposits). Operating income growth increased significantly (by 2.25 percent) in Q2 2018, reversing the 1.37 percent decline of the previous quarter. This was driven by an increase in interest income, which grew by 3.11 percent in Q2 2018, the result of the increase in L&A and – more importantly – an increase in yield on credit (YoC). Net interest margin (NIM) again increased (by 2.61 percent), at a higher rate than in Q1 2018 (2.55 percent). The increase was driven by a rise in YoC, which more than offset a parallel increase in cost of funds. Only three of the top 10 banks reported a decrease in NIM. However, the increase in operating income was not sufficient to reduce the Cost-to-Income (C/I) ratio, which at 33.0 percent was 70 basis points (bps) higher than in Q1 2018 (32.3 percent). An increased level of Sales & General and Administrative Expenses was the main reason for the increase. Cost of risk was marginally lower (from 0.81 percent in Q1 2018 to 0.78 percent in Q2 2018), as banks continued to reduce their loan loss provisions. Return on equity (ROE) increased due to a decrease in cost of risk and an increase in operating income, despite a slight decrease to return on assets (ROA). Seven out of 10 banks showed an increase in ROE Average Capital Adequacy Ratio (CAR) increased to 16.33 per cent (compared with 15.6 per- cent in Q1 2018). Alvarez & Marsal’s report uses independently-sourced published market data and 16 different metrics to assess the banks’ key performance areas including size, liquidity, income, operating efficiency, risk, profitability and capital. The country’s 10 largest listed banks analysed in A&M’s UAE Banking Pulse are First Abu Dhabi Bank (FAB), Emirates NBD (ENBD), Abu Dhabi Commercial Bank (ADCB), Dubai Islamic Bank (DIB), Mashreq Bank (Mashreq), Abu Dhabi Islamic Bank (ADIB), Union National Bank (UNB), Commercial Bank of Dubai (CBD), National Bank of Ras Al-Khaimah (RAK), and the National Bank of Fujairah (NBF). The table below sets out the key metrics, with the underlying theme being an increase in profitability, and stable liquidity. A&M Managing Director in the firm’s Financial Institutions Advisory Services practice Dr. Saeeda Jaffar served as lead author. A&M Managing Directors Asad Ahmed and Neil Hayward, who specialize in turnaround and restructuring, co-authored the report.